Pink Blush Maternity Clothes giveaway! I am 22 weeks into my 4th pregnancy and I vowed to myself that this time around I would get rid of at least a few of the most hideous maternity tops that I bought at the second hand store over 8 years ago and replace them with some really cute tops, like the ones I found on Pink Blush Maternity. I was throwing all my insecurities to the side and BOY am I ever glad that I did….because now I have this super cute coral top from Pink Blush Maternity and honestly, I realized I might just be able to pull off the cute pregnant lady look! This shirt is 95% rayon and 5% spandex making it a SUPER stretchy and very comfortable to wear. It is very breathable and is going to be perfect for my summer time pregnancy. 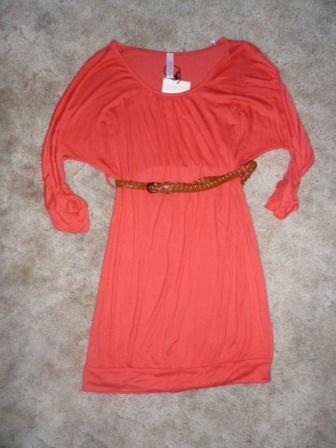 It is light weight and I love that the fashionable belt is included with the shirt. It sports 3/4 sleeves that are easily rolled to the length you prefer. The thing that really drew me to this top was the length. I don’t have the small lower body to rock the long wear look, but I LOVE that I can fold this top under to make sure my stretchy band on my pants is covered. I know everyone knows I am wearing stretchy pants, but I don’t like to show it off! 😉 Look how long this shirt is! I love good coverage! This top is on sale for $30 right now and I even saw that Pink Blush Maternity has a sale running through March 28th to take 20% off your entire order by using coupon code: SPRINGSALE32 when you check out! Woot woot! What I think I love most about this top is I FEEL PRETTY in it. A feeling I’ve been missing as I spent the last 5 months on the bathroom floor just trying to get up and survive the morning sickness phase that never seems to leave in the afternoon or at 3 months. It is a priceless feeling. Thank you Pink Blush Maternity! Pink Blush Maternity offers so many cute things besides tops. They have dresses, pants, shorts, skirts, nursing clothes, and more! Pink Blush Maternity has offered to give away a $25 gift card to their site! Just fill out the entry form below. This giveaway is open to US only and will end at 11:59 pm EST on April 1st. I will use random.org to get a random winner then email them on April 2nd (so they don’t think it is an April’s fools joke-ha!) GOOD luck! Entry #316 Lauren! Congrats Lauren, you have been emailed and have 24 hours to reply or a new winner will be chosen. Hope to hear from you soon! Disclosure: I was given the shirt pictured above to review and give an honest report about. All opinions expressed above are my own and not swayed by our arrangement. This giveaway will be fulfilled by Pink Blush Maternity. I like the Cream Floral 3/4 Sleeve Maternity top. It is all so cute, I can’t just pick one. But I love the navy belted top and the lace belted dresses! I’d love ts to give a friend who cant afford stuff right now. 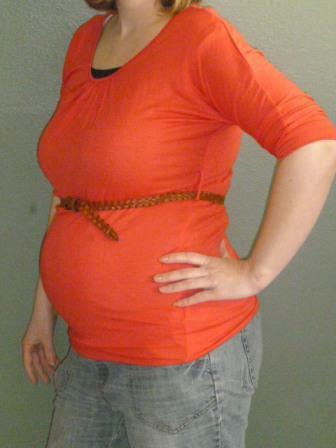 I like the Navy Blue Belted 3/4 Sleeve Maternity Top. 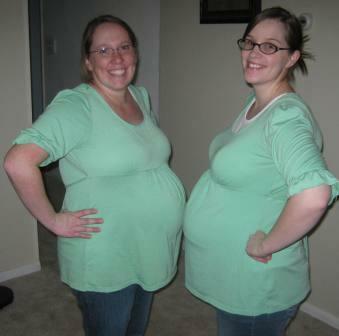 there are lots of things i like but really think the green Maternity Tank Top is adorable. I love the coral maxi skirt! Navy blue maternity tank top is very cute. I am expecting my first grandchild in October and would love to get my DIL some cute maternity clothes!!! I’m not pregnant yet but actively trying for #2 🙂 I love all the comfy looking dresses! I love just about everything from pink blush! I’m expecting my first in october, and the first maternity top I bought was a pink blush one from zulilly! Can’t wait til I’m showing enough to wear it! 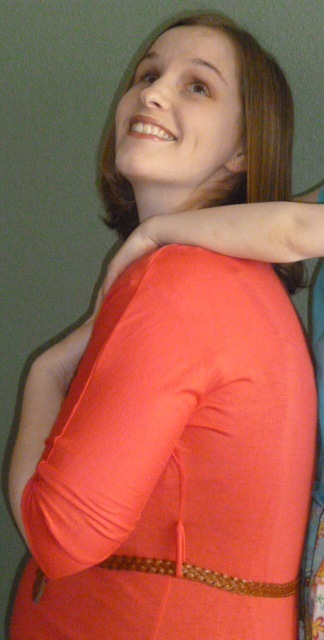 I love the coral top you are wearing! The dark yellow maternity sleep shirt looks so cheerful and comfy! Blue Chevron Textured Maternity Tank Top. The Black Lace 3/4 Sleeve Maternity Tunic is my favorite. I love the royal blue basic maternity maxi dress. I like the Yellow 3/4 Sleeve Fitted Maternity Top. Love the maxi dresses! Especially the pink with the blue chevron stripe. Beautiful! I am a sucker for nice tops or pretty dresses 🙂 Love this company, their clothes are so cute! I really like the purple grey striped maternity top! I love all the colors but would love to get the Royal Blue Basic Maternity Maxi Dress for my baby shower since I’m having a boy. So many cute things! I love the Navy Blue Belted Basic Maternity Dress. I love the Navy Blue Belted Basic Maternity Dress. I love the Blush Pink Lace maternity dress. I love so many of the items that it was very hard to choose a favorite. I love the Blush Pink or Mint Green Lace maternity dress. I love their white linen maternity pants! I like the Turquoise White Printed Maternity Top! I love the orange shirt you posted! My favorite is the royal blue basic maternity maxi dress! love having the legs covered for days when you don’t feel like or can’t reach your legs to shave! I like the Multi Colored Wave Maternity Top. I love the BEIGE LACE COLORBLOCK MATERNITY MAXI DRESS, it is so adorable!! I love the Jade Lace 3/4 Sleeve Maternity Tunic! The Red Maternity Cami would be great since she’s gonna be at her biggest when the weather is at it’s hottest! I like the White Black Bird Print Scarf. I love the Grey Floral Jean Maternity shorts!! They are so cute!! I will give this to a friend if I get it. Too many things to pick from! I will be gifting to a young lady who lost a child and is currently pregnant. She has been like a daughter to me and is in need of clothes. I would love to win this for my expectant friend, Anita Kelly! TYVM for the chance! I would give this to my pregnant daughter! I love all of their clothes it is so hard to pick.